"Richards reflects on how rich life becomes when one travels her own best path. . . . Richards writes more courageously than she perhaps realizes, and each page of this uplifting book will touch a chord in everyone who enjoyed her first book." --"Booklist "
"Charismatic. . . Engaging writing by an honest self-explorer." --"Kirkus Reviews"
Praise for "Chosen by a Horse"
"An inspired story of what family means, and what the loss of one can do to us, and for us." --"The Boston Globe"
"An incredibly moving story, beautifully written and insightful." 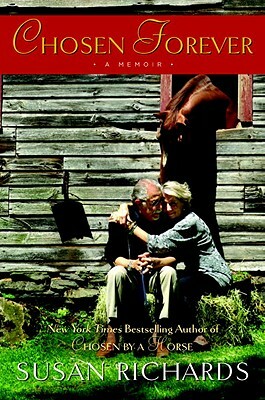 --"The Roanoke Times"
"Two kindred spirits find each other in this beautifully written memoir." --Temple Grandin, author of "Animals in Translation"
When Susan Richards adopted an abused horse rescued by the local SPCA, she didn't know how Lay Me Down's loving nature would touch her heart--and change her life. Susan, a writing teacher, had lost her mother at the age of five and been abandoned by her father to uncaring relatives; she had endured an unhappy marriage ending in divorce and had self-medicated for anxiety and repressed anger with alcohol. For more than a decade, she aspired to be published, but it was only with the memoir she wrote to honor Lay Me Down that she achieved this goal. The book led to a book tour, in the course of which Susan reconnected with family and friends. But even more joyously, at the second reading on her tour she met the man who had sold her his house twenty-four years earlier, a world-famous photographer, Dennis Stock. And they fell in love. Is perseverance as important as inspiration to a would-be writer? Discuss. Can a woman inspire love if she thinks she's unattractive? Do you think that the more than twenty-year age difference between Susan and Dennis should have prevented them from marrying? How do animals differ from humans as catalysts for change? The advantages of wealth are myriad. What are the disadvantages? What makes "home" different from anywhere else? What are the challenges older couples face when trying to integrate their lives? Has a seemingly random "sign" ever helped you make a decision? What accounts for the current popularity of memoirs? What do people want from a memoir? Are the loss of a child and the loss of a pet equal? Did you learn things about the inside of the publishing world that surprised you? Did you think that publishers and writers all made a lot of money right away?